Who better to write a book on fashion and style than Tim Gunn and Kate Moloney. As the much loved style consultant and mentor to aspiring designers on the hit reality show Project Runway, Gunn and his former colleague and current best friend Moloney, the Assistant Chair of fashion design at Parsons, The New School for Design share their fashion wisdom in Tim Gunn: A Guide to Quality, Taste, and Style. I sat down with the fashion therapists to discuss what’s hot, what’s not, and of course to dish about Project Runway. FUSN: The fashion industry can be brutal – of all the contestants on Project Runway, who has what it takes to make it in this biz? TG: I have a long list of people – there’s Jay McCarroll, Kevin Johnn, and Alexandra Vidal from season 1, and then there’s Santino Rice and Andrae Gonzalo from season 2. FUSN: Do you keep in touch with any of the contestants? TG: I do keep in touch, it’s not constant, but we do check in with each other. FUSN: Do you have any favorites or who really stands out to you? TG: For our winners, that’s the case – Jay McCarroll, Chloe Dao, Jeffrey Sebelia. And the final 3 in the first two seasons and the final 4 in the third season. I would keep an eye on all of them. FUSN: Skinny jeans – in or out? TG: Ughhhh – some people can wear them and they can wear them at any time, but most people should avoid them. KM: Ehhh – right now they’re here. But in about 9 months we’ll see the denim trend go back to the wide leg. FUSN: Ok, then what about leggings? KM: Anyone can wear them. KM: Yes. As long as their ankles are proportional. Let me see your ankles. FUSN: Ok, I’ll take your word for it. FUSN: For all those aspiring designers slash reality stars who are reading this & want to audition for Project Runway, how far can they go to stand out and not look like nut-jobs? TG: (Laughs) We’re looking for talent, not personality, point of view of individual, facility to execute clothing, and we’re looking for fashion most specifically – these things matter to me. Personality is a nice enhancement, but if the design aptitude and facility isn’t there, it doesn’t matter. FUSN: Ok spill it, who’s the celebrity you’re dying to makeover? TG: As opposed to a fashion crisisI worship her, I idolize her and sometimes she gets it right, but more frequently she doesn’t – Meryl Streep. In particular, I’m reflecting on this year’s Academy Awards. She was nominated as the fashion editor, and I was expecting her to be absolutely so far above the crowd in terms of her look that everyone was going to simply fall over in ecstasy and she was so disappointing, I just didn’t get it. FUSN: So how would you have dressed her? TG: She was wearing black, so the tone wasn’t an issue. I think for that event it’s best to go full length and her skirt stopped about mid-calf which I think is unflattering on any woman. I would’ve kept her in elegant, sophisticated, nighttime jewelry, not coral and turquoise which I think is too sporty and daywear and I would let her show off a lot of her fabulous cleavage, and her top and shoulders. FUSN: Ok Kate, so who’s the celebrity you’re dying to make over? Since Tim went with Meryl Streep, let’s go with someone younger. KM: Then I would have to say Lindsay Lohan. She’s a beautiful girl, but it’s all too much at once. She’s overexposed. FUSN: But she’s (Lindsay) usually written up for her fashion sense. FUSN: Very profound! And very true. FUSN: What’s hot for summer? TG: Depending on your proclivity you can go anywhere. Footwear of choice is the ballet flat, it’s just very day. It can be dressed up and it can be dressy, but it can really go anywhere in its own way and it looks great with a pair of shorts, or a skirt or pants. But for summer, I have a word of caution – don’t bare that midriff! Don’t! Not even if you’re 12 years old – don’t do it! KM: I like the jersey t-shirt dresses whether they’re boatneck or racerback. 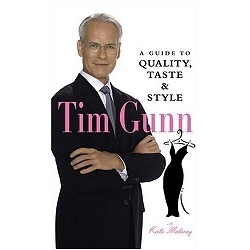 Tim Gunn: A Guide to Quality, Taste, and Style ($17.95) is now available online at Amazon.com or at your local bookstore.